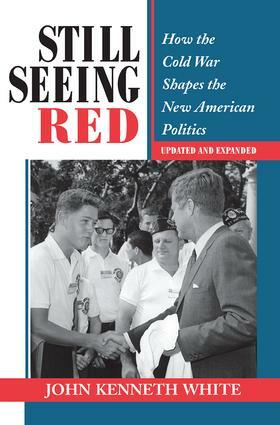 In Still Seeing Red, John Kenneth White explores how the Cold War molded the internal politics of the United States. In a powerful narrative backed by a rich treasure trove of polling data, White takes the reader through the Cold War years, describing its effect in redrawing the electoral map as we came to know it after World War II. The primary beneficiaries of the altered landscape were reinvigorated Republicans who emerged after five successive defeats to tar the Democrats with the ?soft on communism? epithet. A new nationalist Republican party?whose Cold War prescription for winning the White House was copyrighted to Dwight Eisenhower, Richard M. Nixon, Barry Goldwater, and Ronald Reagan?attained primacy in presidential politics because of two contradictory impulses embedded in the American character: a fanatical preoccupation with communism and a robust liberalism. From 1952 to 1988 Republicans won the presidency seven times in ten tries. The rare Democratic victors?John F. Kennedy, Lyndon B. Johnson, and Jimmy Carter?attempted to rearm the Democratic party to fight the Cold War. Their collective failure says much about the politics of the period. Even so, the Republican dream of becoming a majority party became perverted as the Grand Old Party was recast into a top-down party routinely winning the presidency even as its electoral base remained relatively stagnant.In the post?Cold War era, Americans are coming to appreciate how the fifty-year struggle with the Soviet Union organized thinking in such diverse areas as civil rights, social welfare, education, and defense policy. At the same time, Americans are also more aware of how the Cold War shaped their lives?from the ?duck and cover? drills in the classrooms to the bomb shelters dug in the backyard when most Baby Boomers were growing up. Like millions of Baby Boomers, Bill Clinton can truthfully say, ?I am a child of the Cold War. ?With the last gasp of the Soviet Union, Baby Boomers and others are learning that the politics of the Cold War are hard to shed. As the electoral maps are being redrawn once more in the Clinton years, landmarks left behind by the Cold War provide an important reference point. In the height of the Cold War, voters divided the world into ?us? noncommunists versus ?them? communists and reduced contests for the presidency into battles of which party would be tougher in dealing with the Evil Empire. But in a convoluted post?Cold War era, politics defies such simple characteristics and presidents find it harder to lead. Recalling how John F. Kennedy could so easily rally public opinion, an exasperated Bill Clinton once lamented, ?Gosh, I miss the Cold War. ?